Success is the best form of revenge, they say, and as such, Sibanye is dishing it out in spades. The once-unloved orphan child set adrift by Gold Fields has seen its share price more than double since it was listed in February last year. The company continues to squeeze life out of three older assets it took control of at its foundation, Kloof, Driefontein and Beatrix. E&MJ was invited along for an underground inspection of the venerable old lady of the three, Driefontein. Gold was first discovered in the Carltonville area west of Johannesburg in 1939. War interrupted the development of the deposit but began days after the U.S. bombed Hiroshima. Ever since, Driefontein has steadily produced gold. Gold mineralization occurs at depths between 3,200 ft and 13,000 ft below surface. Two major orebodies, the Carbon Leader Reef (CLR) and the Ventersdorp Contact Reef, are the major contributors to production with a third, the Middelvlei Reef, making a small contribution. The CLR comprises various facies from single carbon seam to single and multiple band conglomerates. It is a high-grade reef at the base of the Central Rand Group, and at Driefontein it dips at 25°. Keeping the network of shafts and access tunnels operational is quite an undertaking. The complex spans 68 miles. 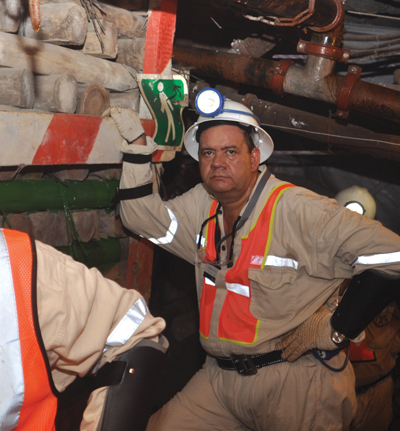 “We have 27 holes leading into the mine, shafts and vent shafts,” Barnard said. Because it lies under porous dolomite formations, flooding is a constant threat. Around 26 million gallons a day are pumped out, at a cost of nearly $100 million annually. Production is running at roughly 700,000 oz/yr and is expected to remain at this level, gradually tapering off from 2022. Currently, life of mine extends to about 2030 with the last few years of production coming from support pillars as the mine is gradually shuttered. However, Driefontein may yet live on beyond her projected years. Technical studies are under way to exploit “white areas”—potential project zones that were left intact because of cost or engineering challenges. A study by previous owner Gold Fields indicated that 8.8 million oz of gold could lie below the mine’s existing infrastructure, which has reached a depth of 2.1 miles. The deepening of No. 9 subvertical shaft would extend Driefontein’s life by at least 13 years to around 2035. The company has also been evaluating the recovery of high-grade CLR pillars from the No. 10 Shaft complex. So far, the numbers are looking satisfactory. During the six months to December, group gold production increased 18% from the previous six months to 774,600 oz; cash costs fell 12% to $804/oz; and it has increased reserves 46% to 19.7 million oz, extending the life of its mines by five years to more than 13, according to the company’s annual report. Given its success and a comfortable production outlook, it’s perhaps not surprising that CEO Neil Froneman is on the hunt for new assets. He has indicated that Sibanye is talking to platinum producers about an acquisition, as well as other opportunities. It’s the acquisition of the Burnstone mine, the troublesome deposit to the east of Johannesburg, that could determine the company’s long-term fate. Currently, Sibanye is digesting Wits Gold, following a R407 million ($38 million) bid made in December. This will give it a sizeable land holding in the Free State and access to the newly built Burnstone in Mpumalanga province, which Wits is buying from the liquidators of Great Basin Gold. Koos Barnard, vice president of Driefontein, says the mine produced up to 2 tons of gold a month in its heyday. It will now fall to Sibanye to pick up the tab to bring the Burnstone mine into production of about 100,000 oz a year. 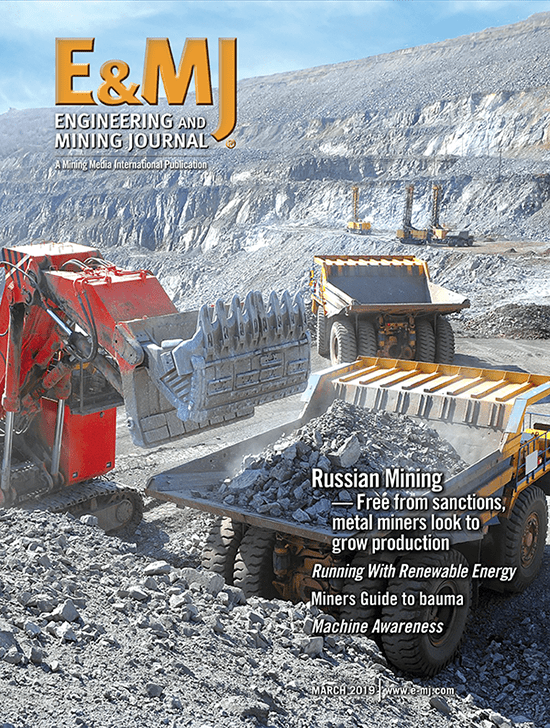 Sibanye may have proved itself in managing costly deep level mines, but Burnstone, a relatively shallow deposit with complicated geology, may be harder to master. Burnstone has already brought one company to its knees and forced another to seek a white knight to come to its rescue. Construction began in 2006 by Canada-listed Great Basin under the stewardship of CEO Ferdi Dippenaar. It soon ran into trouble, producing only 38,000 oz of gold before being placed on care and maintenance in mid-2012. Great Basin went into business rescue and Burnstone was acquired by Wits Gold. “If we fail at Burnstone, then that’s the end of Wits Gold,” Wits CEO Philip Kotze told Miningmx in July 2013. “We have got an opportunity to reposition this mine. 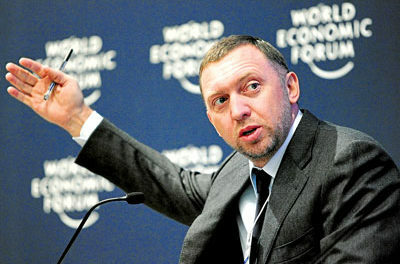 It was certainly the lowest risk mine that we could get into operation by a long way,” he said. Sibanye now hopes to turn this difficult asset into a profitable mine. Although the price for Wits Gold was relatively modest, it will require a formidable investment to return Burnstone to production. “Burnstone was acquired at virtually no cost but Sibanye needs to spend around R1.3 billion ($123 million) over the next 3-4 years to bring the mine to life again,” said Kobus Nell, resource analyst at Stanlib. 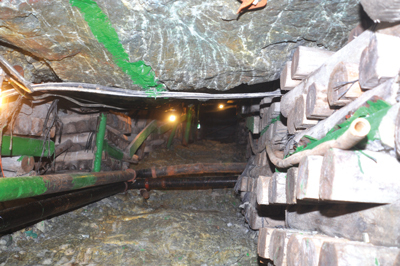 The mine has 6.4 million oz of reserves and a 21.7-million-oz resource. Nell said Burnstone is a high-risk asset that is difficult to mine because of very thin channel widths and highly carbonaceous rock, with a high-dilution risk. According to previous owner Great Basin Gold’s website, which at the time of this writing was still up, Burnstone consists of placer deposits hosted within coarse-grained sediments deposited in braided stream channels on broad river plains. Economic gold concentrations commonly extend for several kilometers down the dip, and for up to 50 km along strike of the sedimentary rock units. Gold occurs as detrital grains in nugget-like shapes and secondary re-crystallized grains, ranging in size between 0.005 and 0.5 mm in diameter. This left the company in a position of not having enough operational cash flow to fund further development, he added. “Froneman has, however, shown the ability to turn assets around, but some still question the level of sustainability. The strategy on Burnstone may be to try and run a very lean operation, gain access to low hanging fruit and deliver much improved results. However, sustainability is dependent on further reserve development. This requires capital that could conflict with Sibanye’s ‘high dividend paying’ proposed strategy,” said Nell. A central question to Burnstone’s return to production will be whether it will continue to use a narrow stoping mechanized mining method that was initiated by Dippenaar. It was the move to mechanization—at odds with the convention of labor intensive mining in South Africa—that was ascribed to Burnstone’s cash drain that eventually sunk Great Basin. Dippenaar through a spokesman declined to comment. Complex geology has defied mechanization and Driefontein still relies on traditional hand drilling. 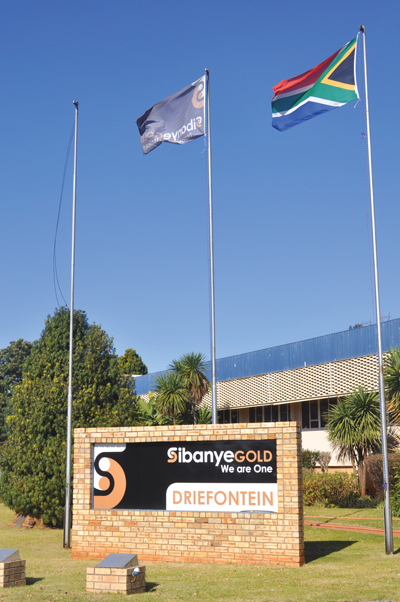 Sibanye plans to use the same methodology at Burnstone. “The reason why the previous companies failed was because of the mining method used,” said Sibonginkosi Nyanga, equity research analyst at Imara S.P. Reid Stockbrokers. 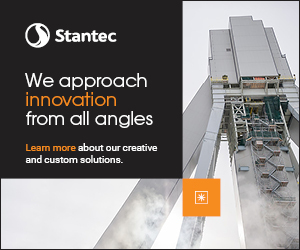 “Dilution resulted in more waste being sent to the mill resulting in very low yield. The long-hole stoping method failed and I think there is a need for a change in the mine design and mining method. The mine, reasonably shallow in terms of gold mining in South Africa, has two shafts—a decline shaft to move machinery in and out of the operation and a vertical shaft for transporting men and materials, as well as rock-hoisting. Ventilation and water conduits are accommodated in the vertical shaft. Extensive stoping in mined out areas is giving access to lower grade deposits known as ‘white zones’ to extend Driefontein’s life. Sandvik twin-boom drill jumbo, LHDs and 30-metric-ton underground trucks formed the basis of the operations’ mechanized fleet. It was in all respects a state-of-the art operation, yet it failed. Stewart said the company paid a nominal $7 million for Burnstone, which included its debt of $177 million that comes ring-fenced to the mine itself so protecting Sibanye from historic financial liability. “It takes 10 years to develop a mine—and all that work has already been done and so the project is already mostly de-risked. There’s been $500 million in capital already spent. How can you not do it? To start a project from zero with most of the work already done is a unique position to be in,” Stewart said. Stewart said the approach will use conventional and well-understood mining layouts. Selective breast mining with scraper cleaning will be used at the stope face, with a mechanized footwall infrastructure implemented. 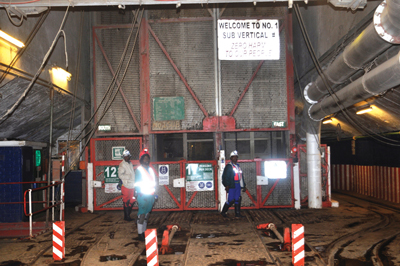 Mine workers have to take three different shafts to access the lower levels of Driefontein. Mechanization on reef will be removed to reduce dilution and higher grade blocks will be targeted first. 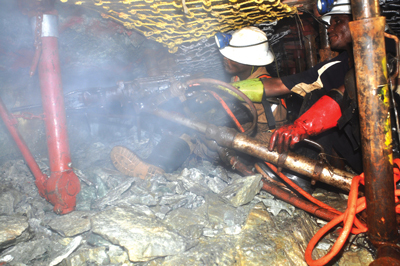 Extensive drilling has also taken place—under previous owners as well as by Sibanye. “More than 460 boreholes have been sunk. That’s more than any other mine on the Wits basin,” said Stewart. There’s still work to be done. A detailed sediment and structural modelling study has begun, and all boreholes will be re-logged. A detailed seismic survey will be carried out next year. “By carrying out a detailed review of the ore body and using appropriate and understood mining methods, we think we can take the risk out of the project,” Stewart said.